I am so excited to have Melissa here for Book Talk Thursday while I am away enjoying my first full day at Disney! She has a great book to highlight today that is one of my personal favorites! Hi! It's Melissa from Don't Let the Teacher Stay Up Late, and I am so excited to be guest blogging for Andrea's Book Talk Thursday! Normally I'm one of those "bad teachers" that refuses to read any professional development books without having them assigned to me, ESPECIALLY if it's my summer. Summer is my time to read what I want and avoid work as much as possible. However, another teacher was telling me about this great book for expanding vocabulary, and it really caught my eye. Now when I say it really caught my eye, I mean that I actually bought it at the very beginning of the school year and then read the first 2 chapters before deciding I was overwhelmed with the beginning of school and would have to wait until later. Later finally came during our state testing when I suddenly had tons of time on my hands to do nothing but read or almost fall asleep watching kids test. This was my lifesaver! Hundreds of thousands of teachers have used this highly practical guide to help K-12 students enlarge their vocabulary and get involved in noticing, understanding, and using new words. 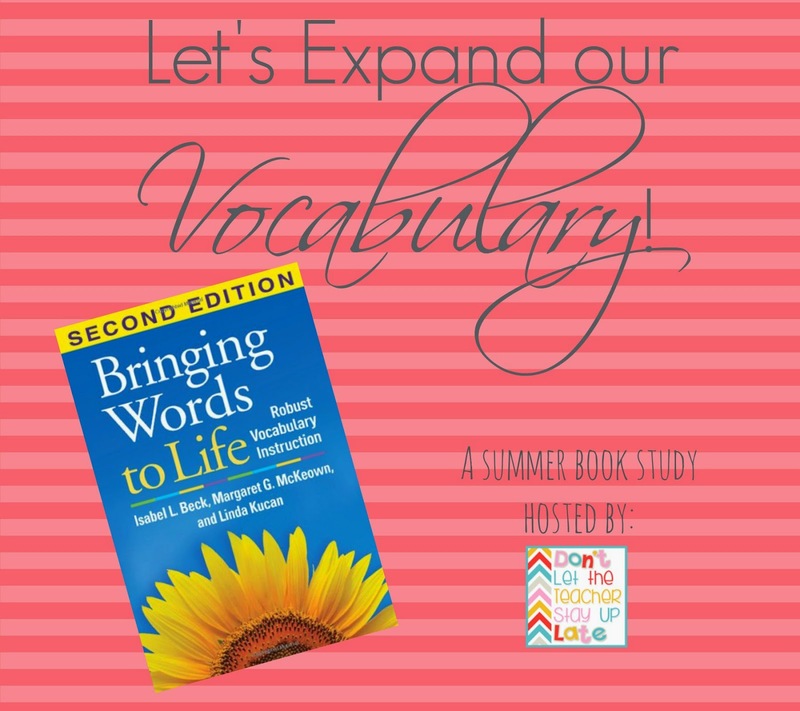 Grounded in research, the book explains how to select words for instruction, introduce their meanings, and create engaging learning activities that promote both word knowledge and reading comprehension. The authors are trusted experts who draw on extensive experience in diverse classrooms and schools. Sample lessons and vignettes, children's literature suggestions, end-of-chapter summaries, and "Your Turn" learning activities enhance the book's utility as a classroom resource, professional development tool, or course text. I'm actually still working my way through the book, but I already have so many ideas for what I can do and how to better implement vocabulary instruction in my class. Plus I want to share these ideas with everyone because I think a lot of us probably struggle with meaningful, robust vocabulary instruction. So I decided that I will do a book study over the summer, and I would love for you to join me! It will begin next Wednesday, June 18, and it will run for 10 weeks (one week for each chapter of the book). I would recommend buying the book yourself as well because they provide some great examples and activities that you will want to have close at hand. Then be sure to click on the picture below to make sure you are following my blog before the study begins! Thanks, Melissa for hanging out today! I hope you, my readers, will join in her book study! I wish I were home to be a part of it, but I am enjoying DisneyWorld! See you when I return! Thanks for the tip! I just bought it on my Kindle!